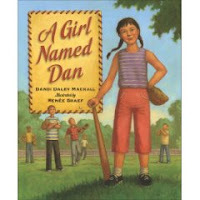 This picture book, A Girl Named Dan, by Dandi Daley Mackall, and illustrated by Renee Graef, was actually a reread for me. I'm not sure why I didn't blog about it the first time, but in a historic year when one woman campaigned to be President, and now, another woman could possibly be a heartbeat from the Presidency, this book reminded me of how far women have come, and how much all of this can show young girls nowadays about reaching for what you want. The sky is the limit whether you are male or female, and regardless of the color of your skin. Based on the author's note at the beginning of A Girl Named Dan, and the About the Author info on the back jacketflap, one would assume this story is nonfiction and based upon the author's life. "I may not have been a fence-buster, but I could 'hit 'em where they ain't' every time. And I had good leather in the field, with speed for showestring catches." But there came a time when the boys told Dandi she couldn't play anymore; it would be "boys only" from now on. That meant she had to do things other girls did: talk about movie stars and swing on the swings -- all things she hated. But then, an opportunity of a lifetime presented itself. There was going to be an essay contest to get batboys for the Kansas City A's. Dandi was so excited, until a boy pointed out to her that in the rules, it said "For Boys Only". That didn't stop her. She entered an essay (beautifully written) under the name of Dan Daley, and she won!! Unfortunately, when the men representing the team came to her door and found out she was a girl, they took her winning away. The rest of the story deals with how Dandi handles her disappointment in a way that all students will be able to relate to. So, I like this book because it shows a strong female character, it dabbles with injustice, it has some beautiful language throughout, and I especially love that the winning essay was the start of a lifetime of writing for this author. As you can see, there are many reasons to share this book with children. A Girl Named Dan can point out the possibilities for all of us! Wow! I have an amazing class this year! The first day of school, we already launched our reading workshop -- complete with mini-lesson, independent reading for the students while I chatted with each of them about their book choice (note: we will need to have many conversations about what being in a "just right" book means! ), and a sharing at the end. I was amazed at how engrossed all 24 of them were when I asked them to read independently!! How great is that?!! After much debating with myself, I started the year with No Talking by Andrew Cements as our first read aloud. All the other choices I was thinking about will make their way into read aloud eventually, but, for now, these students are totally buying into the "no talking" contest in the book. They were cracking up when I read the part where one of the main characters, Lynsey, is in a verbal marathon about a sweater she wanted to buy -- it was so fun!! The fact that the book is about fifth graders is just one more hook for them. So, first week means wonderful things in the classroom, but doesn't leave much time for blogging. Luckily, Bill has had a few things to blog lately. How great is his newly created reading space??!! I hope your students, your own children, or children you may know all have as wonderful of a first week as I did!! I feel very blessed! WHEW! The start of school craziness has really cut into my blogging and reading time! Between getting my library ready, my kids ready, and attending all of the beginning of the year events, curriculum nights, soccer games, meet the teacher, time is limited. However, I'm finding time now to share the pix of my new space as part of Franki and Mary Lee's Trading Spaces event. Last year when I moved into the library, I inherited a lab of approximately 25 old blue Mac computers. I gave them a year of crowding my space to see how they were used. What I found was that I was the only one that used them much, and they were slow and frustrating. So, I got permission to remove them and was able to open a great little reading nook for the kids. Everything you see in the pictures was already in the library somewhere and it gave my space a cluttered look. By opening up the reading nook, I also created more open space in the whole room, making traffic flow much smoother and workable. I can't wait for the kids to start using the space next week, as they visit me this week, they are excited about spending some time back there too. Here are the pix with some brief captions. First, let me share the mural we had painted about 3 years ago. As I have mentioned our former principal retired to do mission work in Africa, and our PTO paid to carry that theme into the library. I had to cut the mural into to halves to show you, and believe me these photos don't really do it justice. Next is the space created by removing the computers and moving all of the pieces of furniture in. It's still a little sparse, but it's a beginning. And now some close ups of the new reading nook. In the first I have displayed part of my Presidential Election Collection. I'm still waiting for the current candidates to produce their signs with running mates to add to the top. I've built this collection over the years with the help of students and parents. The huge bean bag chair in this picture is awesome! I find myself wanting to take a nap on it from time to time, and the kids love it. The really cool thing is that it never loses its shape or flattens out, it also weighs about a ton! The George Washington portrait came from my parents who think every classroom needs a portrait of George Washington. One of my second graders couldn't believe that I could afford such a beautiful portrait. I found that it's really hard to take pictures that show off this space, but hopefully you get the idea. I've heard many very positive comments on how comfortable the area looks and how inviting it feels from parents, colleagues and kids. It's a work in progress, but I'm pleased with the results so far. Beware of the Frog in the Pit! Here's a quick PICK FROM THE PIT entry in this season of going back to school hustle and bustle. William Bee's Beware of the Frog is an incredibly simple yet incredibly fun book. I found myself laughing out loud, especially at the surprising end, which will not be revealed here. You'll have to read the book to find out. Mrs. Collywobbles lives alone in the wood where her house is protected by a frog, yes, a frog. Three humorously scary villains, Greedy Goblin, Smelly Troll, and Giant Hungry Ogre pay her a visit. Of course, none of them are afraid of her small green security system, and all three pay the price as shown by their limbs hanging from the frog's mouth. As I mentioned before, this simple story comes to a very surprising end, I loved it, and I can't wait to share it in THE PIT with the kids, big surprising fun awaits! The illustrations are colorful and fun to look at and make the story really work, the final illustration which shows the surprise, did I mention there's a surprise ending? will surely get a laugh in THE PIT! Here's another review at Menasha Kids. In the effort to get my eighth grade son to read this summer I told him I wanted to read a book with him. After two false starts, books that I had read and thought he would enjoy, I happened upon Ridley Pearson's Kingdom Keepers. I found these two titles while looking at an advance copy of Science Fair by Pearson and Dave Barry that I reviewed here. 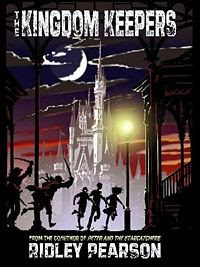 The Kingdom Keepers takes place in Disney World after dark, after closing. It seems that the main character Finn Whitman has been chosen to be a Disney Host Interactive or DHI, a holographic image of himself that will lead visitors to the park around. Cool science fiction stuff that I don't really understand but it didn't matter! As a fan of Disney, I can almost believe they are currently working on this technology. Due a glitch in the system created by the villains of Disney, Finn and the other DHI kids are transported to the park every time they fall asleep. Finn is chosen as the leader by a mysterious old man who lives above the fire station on Main Street U.S.A. named Wayne. Wayne explains that the villains of the park are beginning to take over and indeed, Finn finds himself in a laser battle with the Pirates of the Caribbean. The lasers are being fired from the cars from the Buzz Lightyear ride and in the morning, Finn has the burn marks to prove it. Extremely fun stuff for anyone who has visited Disney as Pearson writes with great detail about the park and the various rides and attractions. My son and I both enjoyed the descriptions and had several conversations as to what was real and what was fiction. The group of DHIs must solve the riddle of the Stonecutter's Quill, a fable shared by Walt himself that gave clues on where the real power of the park lies. In the course of solving it, the kids run into the evil queen from Sleeping Beauty, Maleficent who freezes the air whenever she is around and a mysterious pair of girls Amanda and Jez that add to the suspense and intrigue. We really liked this book, and I was just happy to find a book we could finish this summer. All fans of Disney will love it because the author does such a great job of taking you to the park. Non fans of Disney will like it for the mystery, adventure, humor and suspense. I purchased this for our library and will be sharing it with good third grade readers and up. Ridley Pearson shares some cool background info here at his Kingdom Keepers blog. Other reviews at Big A Little A and Kids Reads. After just spending several days in my classroom, reconfiguring space, I knew I wanted to be part of the Trading Spaces challenge over at A Year of Reading. For the past two years, I've shared a classroom with someone, so our room needed to be a combination of what his needs for our students were, as well as what my needs were. Because of budget cuts, this year I have the classroom to myself, so I was starting all over, creating spaces that I hope will be inviting to students. One of the most important spaces I like to create first is my meeting area with my students. This year, my class meeting area is in the back of my room, and is complete with the chair I sit in for read aloud, a rolling chart stand where all my chart paper is located, and a small table beside my chair that houses my markers for the chart, a small lamp, and our current read aloud (still deciding on what will be my first read aloud). I also am fortunate enough to have a magnetic chalkboard in the back of my room, in this area, as well as the front of the room. This back board is where I hang a lot of the anchor charts the students and I create together. The rest of the meeting space is a big open space for children. My closet doors serve as the back boundary, and bookshelves serve as the sides (its hard to see the shelves on the left). Wall space is so valuable in our classroom that I also use the closet doors. They house the thinking we do about content (science and social studies) vocabulary we do together. This floor space is where we meet for class meetings, reading workshop mini lessons, writing workshop mini lessons, word study mini lessons, and all sharing. There are also pillows in the middle cupboard for the students to get out during reading workshop. After creating my meeting area space, the next most important spaces are the areas in the room that are meant for students. This is the reading nook in our class this year. I have these huge windows in my room, and I wanted the natural light from the windows and the scenery outside of the window to draw students over here. It's nothing fancy -- just 2 fold-up soccer chairs with arms and a place for a drink (my students are allowed to have water bottles) set up in the corner by the window. The table you see is just a cheap stool I bought covered with some inexpensive fabric, and anchored with a light. Voila! A reading nook! In addition, there is a round table on the floor (basically, a table without the legs). Students love to gather on the floor around the table to either read or write. I don't have a teacher's desk, per se, but rather, a little round table (my husband got it from Salvation Army eons ago when he was in law school) that houses my teacher computer, a lamp, lots of Post-its, and some other office supply needs. Right above this table is a small bulletin board that contains pictures of my family. I need the computer at this place in my room because it's right under the tv, and I will be able to demonstrate things to the class from my computer this way. But, I keep it small to make a statement about how much this classroom bleongs to all of us; it doesn't just belong to me. The last spaces that are equally important to me are the places where the books live in our classroom. The display bookcase below will host great mentor nonfiction texts for the first month of school (different genres will be highlighted after that). The four bookshelv es behind the display case will contain even more nonfiction, and possibly some picture books. This area is between the meeting area and the reading nook. Then, there is another nook behind my chart stand where more fiction resides. It also contains, on the top shelves, the kids' language arts boxes. Each child has one, and these are the boxes that hold Book Lovers' Binders, writers' notebooks, and word study notebooks. If you notice all the books on these shelves are currently spine out. That will last for the first week or two of school until the students, as an entire class, figure out how to organize all the books. Then, we will probably have books sorted by genre, author, or series. The kids will sort the books into different tubs, and make the tags that tell what type of book resides in each tub. The final picture shows the bookcases below my bulletin boards that also house reading and writing anchor charts and thinking. In addition, on the top are a couple of things worth mentioning. Since I started following blogs, and then purchasing books I really enjoyed in the last two years, I have highlighted those fabulous books in the teal, hot pink, and black fabric containers. The teal one contains many new series books I hope will "hook" kid s -- Clementine, Moxy Maxwell, Stink, Diary of a Wimpy Kid, etc. The hot pink and black contain many of the new middle grade books I've purchased within the last 2 years that I really want kids to get their hands on!! The wooden bookshelf is where I'll put all new books I get this school year -- picture books, poetry books, nonfiction books, or chapter books. It is designed to have the feel of the New Book section of a bookstore or a library. Last year, highlighting books like this really encouraged students to read them! So, there you have it -- my Trading Spaces. I can't wait to see everyone else's spaces as well! I'm always excited to find a new series to add to our shelves. I've found that kids really like a good series and the way that the characters continue to grow. On a recent trip to my local library, I picked up the first in Tracy Barrett's new series, The Sherlock Files. The first installment is call The 100 Year-Old Secret. The story is based on two main characters, Xena and Xander Holmes, a sister and brother who are distant grandchildren of the famous detective. Tracy Barrett does a great job of developing the two characters, Xena, the older sister likes to make lists and is a little less likely to take a chance than her little brother. She is very good at working puzzles and deductive thinking like her famous relative. Fortunately for the Holmes siblings Xena is an excellent climber. Xander has a photographic memory and is always recalling facts and definitions, which sometimes annoys his older sister. Xander is an athlete and constantly tries to move the duo forward on the mystery, even when they may not quite be ready. The two find themselves in England for a year while their father is a guest music teacher in London. During the first week the two are playing their favorite game in which they try to identify what passers by are all about based only on appearances. The game has been passed down the generations beginning with their many greats grandfather. In the midst of the game they are handed a note which leads them to a meeting of Holmes and Watson relatives. The children are presented with a book that is a collection of Sherlock Holmes' unsolved cases. Xena and Xander decide to work on the case of a missing painting that should be part of an exhibition close to their London apartment. This is where the fun begins! Kids like mysteries they can solve like a puzzle, Cam Jansen, Encyclopedia Brown come to mind. Barrett does an excellent job of creating one of those that younger readers, second or third grade, can get into and solve. The clues are there, not completely obvious, but enough that if a reader is paying attention they can solve this mystery. The tricky part of writing like this is to keep the reader going after they think they have it solved it. Tracey Barrett does that by adding characters the interact with the Holmes kids and keep the other plot interesting. In this book it's a distant relative of Sherlock's sidekick Dr. Watson, Andrew. Andrew is about the age of the Xena and Xander, and very obnoxious! He seems to have a bit of a chip on his shoulder because his famous relative has been overshadowed by Sherlock Holmes. Andrew keeps coming back in the story and creates tension every time so that the reader wants to keep with the story to find out what his deal is! I'm very excited about this series and plan on adding it to the library this year. It will be good to have another option for that group of mystery readers that have finished all of the Encyclopedia Browns and aren't ready for the Hardy Boys and Nancy Drew. Some other reviews at Becky's Book Reviews, and SLJ. Books 2 is slated for May 2009 and book 3, 2010. OK, so I didn't do quite as bad as I originally thought, but it was purely by accident, because it's not like I checked back to look at my progress. Here's my report! 1) RELAX! Yes, thank you! A couple of days at Lakeside with the lovely Mrs., a very fun weekend with my friends golfing in MI, lots of lazy days sitting on my screen porch, GOAL ACCOMPLISHED! 2) Read a lot, I've been doing pretty well with this one so far. CHECK! 3) Have two successful student trips to Boston. CHECK! and CHECK! The first was a bit rocky with some sick kids, but thanks to some excellent chaperone help, all was well! 4) Improve my golf game before my August trip to Michigan. YEAH, WELL, not for a lack of trying! 5) Find at least one book for our Grand Discussions next year. A few possibles, but nothing definite yet. The Underneath might work, even though, (please take a deep breath and sit down) I'm not that crazy about it. 6) Take more morning bike rides. NO, DIDN'T HAPPEN! There you have it all in all I have to label this a pretty successful summer, I just am not really ready for it to end. Summer goals -- how did we do? Back in the beginning of summer, Mary Lee and Franki from A Year of Reading invited any interested parties to post our goals for the summer. Now, it's time for the unveiling of how we did. I have to say I'm 50% pleased, which is better than I do with most of my goals!! I did really well with #2, 3, and 7. I'm especially pleased with #7, because, as anyone who knows me well already knows, if an event is not on a list or on my calendar, it probably won't happen. This summer, more than any summer in memory, I had many opportunities to do spur of the moment things, and I actually did!! For goal #1, I did fairly well, but with all my new-found spontaneity and my children's and husband's work and play schedules, there wasn't as much time together as I had thought, but the time together has been fun. Right now, my 17 year old daughter, my 21 year old daughter, and I are avid Olympics watchers -- we are glued to the TV each night, cheering on the USA! For #4, I got several house projects done, but not all that I had planned. Numbers 5 and 6 were my weakest links -- I did walk and do some strength training, but not with the regularity I had planned. And new recipes -- that would infer I spent a lot of time in my kitchen, which would amuse my family. All in all, I'm glad I participated in Mary Lee's and Franki's summer goals craziness. It made me feel a little more accountable. Look for Bill's results soon. For all the scoop, head on over to A Year of Reading - here and here. Someone recently asked me what I'll be reading aloud to my 5th graders this coming school year. I wasn't exactly sure, but that question got me thinking, and I have made a list of possibilities, and the reasons I might choose them. Please check out my list, and then leave your read aloud thinking for this year in the comment section. We'd love to hear from you! 1) City of Ember by Jeanne DuPrau -- The movie is coming out this fall, and it would be great to read the book to children so they can experience the story as Jeanne DuPrau meant it to be, before they see it as a movie. Plus, it is also fun to get kids psyched for a movie that originated from a quality children's book. 2) No Talking by Andrew Clements -- The reason to love this book is that Clements really knows how to write books that kids can relate to -- the problems and settings are all ones with which they are familiar. I read this to my class last year, and they loved it!! They had fun trying some of the no talking activities the students in the book experience. The one downside I see to this book is that because Clements is such a commercial name, I might have a lot of students who have already read this book themselves. While I am a huge advocate of re-reads and don't shy away from books that might have been read by a few, when I'm choosing a read aloud, I want to choose a book that most children have not already read themselves. 3) Leepike Ridge by N. D. Wilson -- This book is a great action adventure / survival book. Boy trapped in an underground cave with a dog, water rising in the cave, boy encounters a dead body, boy is saved by a man who has been living underground for quite a while, secret chambers underground, treasure hunters who are bad guys -- what is not to like?!! 4) Kids in 5E & 1 Crazy Year (review) by Virginia Frances Schwartz -- A huge thank you to Bill's sister for sharing this title with him! Anytime a book can talk about the impact of a writing workshop on an entire classroom community, I'm a fan!! I'd love for my students this year to see the correlations between the kids in 5E and themselves. 5) The Gollywhopper Games (review) by Jody Feldman -- What a fun, fun book to share with children! Years ago, I used to love to read Charlie and the Chocolate Factory to my students. They would get lost in the enjoyment of the fantastical world of the Wonka Chocolate Factory. The Gollywhopper Games is just like that, but updated and better. What a fun, entertaining book to read with an entire class! And the challenges throughout the book would be great to try to solve together. 6) The Magic Thief (review) by Sarah Prineas -- While I can't wait to share this new fantasy with my class, I don't think it will be my first read aloud. The second book in this series should be coming out sometime in 2009, so I'd like to time this read aloud for closer to that time. I think many children will be very excited to know they could get their hands on the next book in a timely manner. The Magic Thief is such an accessible fantasy book for children. It has the big book look without all the difficulty of big book fantasy. I really like this book! 7) How to Steal a Dog OR Greetings from Nowhere (review) by Barbara O'Connor -- Here is an author that knows how to write a fabulous book with wonderful characters. I will definitely be reading one of these great books because I want to make sure my students are introduced to this author. I think my kids need to know about an author whose next book is titled The Small Adventure of Popeye and Elvis!! 8) Along Came Spider (review) by James Preller -- That's right, the same James Preller that wrote the Jigsaw Jones mystery series. Only this time, the mystery is how children that don't fit a "typical" child's profile manage to survive school among some of the cruel children. This book is a fabulous opportunity to talk with kids about differences, and how to celebrate them instead of taunting them. 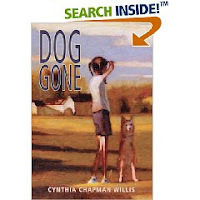 9) Dog Gone (review) by Cynthia Chapman Willis -- Most kids love animals, and this is the perfect book for them. What do you do when the dog you love may be a dog gone bad, and is starting to kill the neighbors' livestock? What do you do when your mom died six months ago, and you can't accept that fact, and didn't even attend the funeral? The main character in this book has to work through these two problems, as well as some others. I envision great conversations about the line between right and wrong, and why that line can be blurred for some people at times. 10) Love That Dog / Hate That Cat (review) by Sharon Creech -- I've read an ARC of Hate That Cat, and loved it! Reading these two books together could lead to some great discussions about sequels. In additon, both stories are entirely written in verse, which is a new favorite genre for me. Also, the inferring skills that readers have to use to make sense of the text could make for interesting thinking and conversation. Well, there you have it -- my thinking about possible read alouds as of August 12. I'm going to make a quick disclaimer, and say this list does not include all the many picture books I read to my students for a variety of reasons. So, what do you think? Do you agree? Disagree? Have some other suggestions? Drop us a note, and let us know what you think. Happy read alouds to all!! After a very relaxing summer, pretty much doing what I wanted to do when I wanted to do it, last week, I was in a class our district offered for 4 days. Wow! I forgot what it was like to be on a schedule. It was actually a very productive time, but I'm glad it's over, and I have exactly 7 workdays before I have to be back at school for real (any teacher knows that means I've been in multiple times already, but again on my own schedule). So, anyway, I've been absent from our blog for a while, but now I'm back, and very appreciative of the fact that Bill had lots to blog about in my absence. The book I just got done reading yesterday was Dog Gone by Cynthia Chapman Willis. I literally read it in 2 sittings in 1 day. I didn't want to put it down. The story revolves around characters with great names: Dill (short for Dylan; the girl who is the main character), Cub (a boy who is one of Dill's best friends and a voice of reason), Dead End (the dog at the center of the story), G.D. (Dill's grandfather), and Lyon (Dill's dad). Chapman develops each character so well that the teacher in me could not help thinking about the wonderful class conversations we could have about characterization, after reading this book. Dog Gone reminded me of several other books I love. Chasing Normal (my review) and Waiting for Normal (Bill's review) are the first two that came to mind -- all three deal with the loss of a child's mother in their daily life (in Chasing Normal, mom moves away, and in Waiting for Normal, the mom is never around, so it's more loss by neglect). However, as I finished the last page, closed Dog Gone, and reflected on it, I realized the book it most reminds me of is Me and the Pumpkin Queen, another book I love. Both of these books deal with a mom who dies, and how the child (in both of these cases, a daughter) learns to grieve and deal with the loss. In Me and the Pumpkin Queen, trying to grow the biggest pumpkin for the Circleville Pumpkin Festival was important. In Dog Gone, it becomes essential to Dill to first deny that her mom's dog, Dead End, might be a dog gone bad (it is rumored that he has gotten bloodthirsty and has joined a pack of dogs that is killing livestock), and then to save Dead End from the fate the local farmers have decided he should receive. Dill has gone several months since her mother's death without once admitting that her mom is dead. It is no wonder that she continues to be in denial about Dog Gone, and then again, when G.D. gets ill and needs to go to the hospital. The last time someone she loved (mom) went to the hospital, they never returned. Because I tend to be drawn to characters that are so well written they seem real to me, it probably won't come as a surprise when I tell you I loved Dog Gone. I was drawn into the characters' lives, and really cared about them.
" 'Your dog stinks worse than roadkill, Dill,' Cub says, wrinkling his nose and puckering his face in a look that screams disgust." "My stomach curdles. The hot, stuffy air gets thicker and hard to breathe as my fingers uncurl from the twine of a hay bale. I wipe sweat from my face. Hay dust scratches." "The hurt let out of the smashed jar didn't suffocate me after all. In fact, the crying made me feel lighter, but also stronger somehow. Sure, the pain might still stomp me like an oversized boot, but it won't kill me. I know that now." I loved Dog Gone on many levels: it made me laugh and cry, it made me care about the characters, and I loved the language. Certainly, it is a book that will stay with me for a while. Fifth grade history teachers, you are going to love this book! One of the tough things about some of the history standards we had to teach was finding appropriate sources. We had to teach about the women's role in the American Revolution, and beyond Molly Pitcher, which I learned was a legend from this book, it was tough to find others. Laurie Halse Anderson, the author of Fever, another of my favorite historical fiction titles, has this new book illustrated by Matt Faulkner. So much information in so few pages. Each page spread discusses the different roles played by women in the fight for independence. Typical roles such as doing laundry, mending and sewing uniforms and non typical roles such as spying and posing as men and fighting. The author provides plenty of detailed examples of each and the illustrator provides colorful drawings with speech bubble depicting the "dames" in action. Kids are going to love the format, and I guarantee the teachers will learn right along with them. Anderson includes the usual, Abigail Adams, Phillis Wheatley, and Sybil Ludington. Also included are the unfamiliar Ann Bailey who enlisted under the name Samuel Gay in Massachusetts and reached the rank of corporal. Who knew that at age 9 Susan Boudinot had her own "tea party" by dumping a cup of British tea out the window of the Royal Governor of New Jersey's mansion, and she didn't even hide behind an Mohawk Indian disguise! Polly Cooper, an Oneida woman took forty warriors and delivered 600 baskets of food to the troops at Valley Forge and stayed behind to serve as a cook for General Washington, refusing payment. 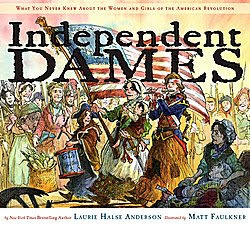 These Independent Dames were heroes and this book is ABSOLUTELY a valuable resource to elementary history teachers. More reviews at The Reading Zone, I.N.K., and Young Readers. In keeping with the theme of finding some new election books for the upcoming school year, Otto Runs For President by Rosemary Wells is a fun look at an election that will be great for younger kids. It's time to elect the school president at Barkadelphia School and the popular kids/puppies Tiffany the cutest and smartest is sure she will win and so are her friends. On the other hand Charles the best athlete says he will win because he has been captain of all the sports teams. Of course they both get the help of their over zealous parents to work on their campaign, and both are guaranteed a win by Mommy and Daddy. The next day stickers supporting the candidates appear, but quiet Otto and his friends notice the campaigns don't believe Charles and Tiffany are interested in the student body's needs, just winning, and Otto enters the race. While the popular dogs are mud slinging at each other, Otto begins to ask all of the students starting with the kindergarten what they would like to see. The mud slinging continues and gets meaner and Otto stays above the fray. When the results are tallied and revealed, Tiffany and Charles are shocked to hear they hadn't won, and Otto had. The parents of the two are also disappointed and Tiffany's mom says Barkadelphia is a "blip" and she will win in junior high. I like the simplicity of this book for younger kids. I think it will make a great intro to the election and campaign process. It will be easy for teachers to tie it to the current events students are seeing and hearing every day. The illustrations are very fun and the characters really come out in the drawings of Tiffany the poodle and Charles the bull dog. I like this one! I found this review at Shelf Employed. I recently discovered that we will elect a new president in November. OK, not recently, about 2 years ago really, and frankly, even though I'm sort of an election news junkie, I have about reached the point of exhaustion with this one. In any case, when school starts in the fall, I know elections will be a significant part of the teaching going on. Knowing this, I have been on the look out for some good new books dealing with politics and elections. My partner Karen blogged See How They Run which looks like a great resource for the classroom but due to its paperback format I passed on purchasing it for the library. I reviewed a preview copy of Mike Lupica's new Comeback Kids book called Long Shot. Recently I finally got my hands on Lane Smith's new picture book called Madam President. The book describes the job of president through the eyes of a little girl. Lane Smith always blends humor with the information. For example, one of the president's duties is to give executive orders. The order given by the young girl is "More waffles please!" A president must attend state funerals, in this case the funeral of a pet frog. The president must choose a capable cabinet, you know, Secretary of State, Treasury, Education, Naps, Pizza, Fantasy, etc. Smith has all of the positions illustrated with a map of Texas for the Sec. of State, a piggy bank, and other humorous depictions. All of it's fun, and all of it will lead to some very teachable moments. The book is a list of all presidential duties and they are all shown through the eyes of a child. While it humorous to adults, I really believe it will make the most important job in the world make sense to young kids. As always award winner Lane Smith's illustrations are interesting and a joy to look at. He includes real pictures with his cartoon drawings and some of the illustrations have collage look to them. I plan on sharing this one in THE PIT in November. My name is Bill and I approve this book review. I just returned from my annual golfing trip to Michigan with 11 other guys. Four days, 126 holes of golf, lots of laughing, and good food. It's our fifth year of going to Augusta, MI and it always signals the beginning of the end of summer for me. I'm beginning to think about going to the school to get a few things done before the kids are back in just about three weeks. For my colleagues reading this, yes, I said I'm going to the school to work well before the powers that be require it. I'm pretty excited about some changes in the library. I've opened up some space to create a bit of a comfortable reading area. Reading Franki's entry at A Year of Reading inspired me to share this with you. I'll be sure to post some pictures when it's finished. 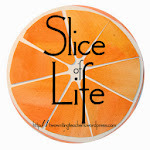 I've been reading your comments on Karen's entry about creating life long readers. While I agree with most of what is said, I think sometimes we're too hard on ourselves as teachers and parents. I also think some of what is seen as best practice sometimes does more harm than good. Let me share my experience to explain what I mean. In my classroom I used to require an assigned amount of reading minutes to my students. I would collect their log sheets and grade them according to the minutes read. I thought this was creating kids who liked to read. Then my own children reached the age of the required reading minutes. Before that they could both be found just enjoying picture books or comics or children's magazines, just because it was fun. My daughter was a master story teller at 4 with voices and everything, very dramatic and watching her retell Snow White is still one of my favorite home videos. Once they had to begin to record minutes for school, reading became an assignment, a chore to be finished by setting a timer and stopping mid sentence when it went off. They stopped reading for pleasure, and to this day, still are not pleasure readers. It breaks my heart. It changed my teaching, and thanks to my friend Maria, the way I kept track of their reading. Instead of minutes, we talked about and kept track of books read in a notebook. Kids who seemed to be slacking were encouraged to read more, or find a genre that fit them better. Kids who read a lot were encouraged to try other genres to stretch themselves. All in all, 52 kids read close to 3000 books as I recall. They were thrilled, and I don't know if they are reading for pleasure now, but they did then. Teachers certainly can inspire kids to become readers, we just have to think creatively and encourage them to form a life long habit. As for the parents as role models, my kids see me read ALL OF THE TIME, and they still don't pick up a book first. It frustrates me, but I keep talking about how much I love to read and hope that at some point they will too. I'm really working with my 13 year old son this summer to find books he likes and wants to read. Right now he and I are reading a Ridley Pearson novel about an adventure at Disney World called Kingdom Keepers. He says he likes it, but he still has to be encouraged to pick it up, he doesn't do it on his own. As for video games, computers, television we'll never compete with it. In my opinion we have to just keep introducing them to great books with the confidence that when they get older and put these things behind, and they will, they will remember some of what we taught them and pick up a good book. Well that' my two cents worth on that, let's take it easy on ourselves and keep sharing great literature with our kids, banking on the fact that we are building a foundation for a life long reader in every student. Much to my family’s delight, I cleaned out the interior of my car before we took a day-long family trip to visit my father-in-law to celebrate his birthday. Up until that point, the inside of my car looked like a “hot mess” as my youngest daughter would say. Where am I going with this? … I found a lovely surprise during this car cleaning – an ARC of Violet Raines Almost Got Struck by Lightning by Danette Haworth. I’m guessing that either it fell out of my bag of ARCs I selected from Cover to Cover during the 48 Hour Challenge in June, or one of my Columbus blogger friends loaned it to me and it got lost in my messy, messy car. Whichever one it was, I am so glad I found this book! The title alone – Violet Raines Almost Got Struck by Lightning – is enough reason to read it, but the story line is great, too! This is a story of a girl caught between her childhood ways and the pulls of adolescence. The main character is Violet Raines. Violet loves her momma who works in the local bakery, her best friend (Lottie), Lottie's family, and her best boy pal, Eddie. The staples in Violet’s life are the things she’s done her entire childhood: Sunday fish fries at Lottie’s house, going to church on Sunday and passing notes with Lottie, exploring the caves, woods, and streams around her hometown of Mitchell Hammock, Florida, looking for Albert, a huge alligator, and once a week collecting great words from the Sunday newspaper in a section called “Today’s Word”. Violet actually cuts the word out and keeps all her wonderful words in a special box (the language arts teacher in me loved the words and the box Violet collected them in – words like “taradiddle” and “magniloquent”). Violet’s life as she knows it is upended when Melissa, a new girl all the way from the big city of Detroit, Michigan, moves into town. Melissa has televisions with soap operas, makeup, a BRA (gasp! ), glittery t-shirts, high heeled shoes, and the glamour of being the girl from the big city. Melissa is the exact opposite of Violet. The plot takes a turn when Lottie, Violet’s life-long best friend, falls under the spell of all the things Melissa is (and Violet isn’t). Violet finds herself being the odd man out, and from there, the plot thickens. This book delighted me so much because it does a wonderful job looking at how we all go through adolescence in different timeframes, and how frustrating that can be to the ones who are slower to get there. It is a classic coming of age story with very realistic characters. The story also examines relationships between people: Violet and Lottie (best friends who hit a rocky patch when the new girl comes to town), Violet and Melissa (polar opposites who just can’t make themselves like each other), Violet and Eddie (nature buddies until the end of the book), Lottie and Melissa (like to do all sorts of girly stuff together), and Melissa and Eddie (she has a big crush on him). 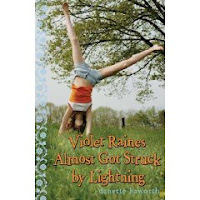 In case you were wondering, the title is not misleading – Violet almost does get struck by lightning. This is actually another big plot twist. This story is really one best suited for girls, since they are the main characters going into adolescence, and there are quite a few conversations about bras and training bras. One of my favorite parts was when Lottie was in “training” for a bra, and was wearing the top of her 2-piece bathing suit! I would love to recommend this book to a group of girls who might read it together for a Book Club. Violet Raines Almost Got Struck by Lightning was such a good read, it actually makes me happy I cleaned my car!! For those of you that don't have it hidden in your messy car, it is due out August 19, 2008. I haven't had a lot of time for making a dent in my to-be-read pile lately, so this morning, I decided to look at one of the picture books in the pile. 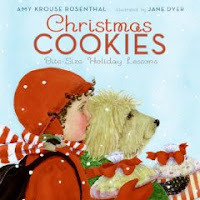 I was so delighted when I found Christmas Cookies: Bite-Size Holiday Lessons by Ann Krouse Rosenthal, and illustrated by Jane Dyer. This is a book I got from a whole table of ARCs back in June from my favorite children's bookstore, Cover to Cover. This book is incredibly sweet, whimsical, and smart! I think this book is probably designed for younger readers (Grade 3 and below), but I could definitely see myself using this in my 5th grade classroom, also. It's a book that deals with vocabulary, traditions, and cookies -- a winning trio in my opinion! The illustrations on the pages about tradition are 3 polka-dotted aprons in different sizes under the text, and on the opposite page, a picture of a girl, a dog, and a rabbit, all in their aprons, stirring something in a bowl. Having the animals as some of the main characters, is what makes this story so whimsical. It's also one of the reasons I think this story would appeal more to younger readers. Some of the other vocabulary addressed in this book: anticipation, appreciative, disappointed, celebrate, prosperity, charitable, responsible, moderation, reciprocate, frustrated, perseverance, selfish, thoughtful, lonely, sharing, gratitude, family, gracious, believe, joy, peace, and hope. What fabulous vocabulary and concepts to share with children!! And having it put into a context that involves baking cookies, an activity with which some children might have background knowledge, really helps readers to understand each vocabulary word. I can envision this book being a starting point for an entire conversation about other cultures and their holidays and traditions. I also see this format as a wonderful one to share with older students as a possible model for their own writing. When reading the front jacket flap, I discovered that this book is a follow-up to an earlier book by Rosenthal called Cookies: Bite-Size Life Lessons. If it's even half as good as Christmas Cookies: Bite-Size Holiday Lessons, it would be a book to add to your collection. The Christmas Cookies book is not due out until the end of September, but it is most definitely a book to remember!! And how can you not enjoy an author who makes cookies the platform for teaching life lessons and vocabulary lessons to children??! !